Cape Town is known as South Africa’s “Mother City” and rightfully so. From the moment one arrives in the city via land, sky or sea, you feel the warmth of the people, the culture and the infamous Table Mountain envelop the soul and one tends to find oneself taking a deep breath and instantly relaxing, becoming absorbed in the city’s style, history and creativity. Not to mention the stunning beaches and infamous laid-back attitude. No trip to Cape Town would be complete without experiencing these amazing 5 sights, which should be a typical “automatic” addition in your itinerary when visiting Cape Town. Table Mountain is not only Cape Town’s backdrop but also one of the 7 Natural Wonders of the World. The majestic mountain towers over the city at 1085 meters in height and is free to visit. There are two ways to ascend: walking up or the less energetic, but rather awe-inspiring aerial cableway that revolves and offers the most magical 360 degree views as it slowly takes visitors to the top of the mountain. Get there in time for the breathtaking sunset over the ocean and a refreshing drink from the café while snapping some postcard-perfect landscape photos. Robben Island is where Nelson Mandela famously spent 18 years of his prison sentence. The island was declared a UNESCO World Heritage Site in 1997 and turned into a museum. Visitors can take daily tours via ferry to the island and be chaperoned around by former prisoners and political figures whose historical stories make the visit emotional and humbling. One is able to enter Mandela’s former cell and have a tour of the actual prison. 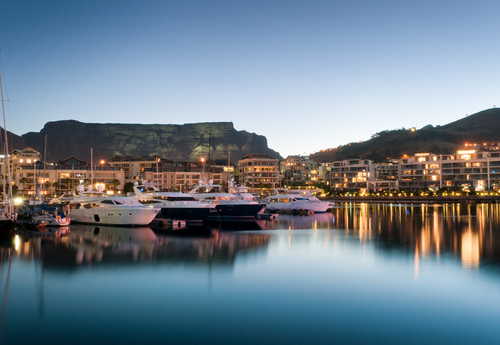 For shopaholics, foodies and people-watchers, the Victoria and Alfred Waterfront is a must! Some of the best restaurants in the city are at the Waterfront along with great clubs, pubs and loads of shops offering everything from supermarket essentials to designer boutiques and African crafts. One can sit next to the harbor and watch the seals frolicking before paying a visit to the Maritime Museum and taking a tour of the impressive Aquarium. This is the place where most helicopter and boat tours depart from and there is always some sort of cultural entertainment happening around the Waterfront. Cape Town is notorious for its world-class wine farms. Stellenbosch is the second oldest town in the country and boasts the Spier wine estate which makes for a fantastic day out. Arrive early to take a tour of the farm and learn about different vines and then head over to the cellar to taste a range of delicious Spier wines before purchasing a couple of bottles to take home. At lunchtime, pay a visit to the deli and purchase a picnic basket that comes complete with mouthwatering cheeses, local wine and crackers and sit alongside the water enjoying the ducks, family atmosphere and great food. Visitors can also visit the estate’s wildlife center to see Eagles and stroke Cheetahs. A township tour is a necessity if visitors want to find out more about the history of the Mother City. A bus trip will take you along areas such as the Cape Flats and teach you about the struggles of the Cape Coloreds and their culture. Cape Town is undoubtedly a vibrant city with many different activities and sights on offer to suit all types of visitors and budget. It is arguably the cultural hub of South Africa complete with parliament, museums, sand, sea and world class clubs. Enjoying various family day tours in Cape Town, is also a way to end off your African safari vacation. Get in touch to book your tour.